If you're a performer who works with backing tracks or musical accompaniment you'll be glad to know that there are better options than remembering to push the "play" button on your CD player at just the right moment. Here is a list of 7 iOS and Android backing track/audio player/effects apps that you can control remotely either hands-free or with a small handheld controller. For remote hands-free operation, all of the apps below will work with AirTurn's pedal and hand-held systems. The AirTurn Digit and DIGIT III have up to six options in a hand-held unit. 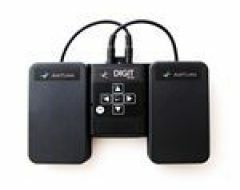 AirTurn DUO and AirTurn PED will enable basic play/pause controls within a music playlist in a 2-pedal foot switch. The AirTurn QUAD will give you four pedal options to alter playlist tracks, tabs, effects and more (depending on the app). And the AirTurn STOMP 6 will give you six programmable pedals to control your lyrics, back tracks, lighting, effects and more depending on the app! 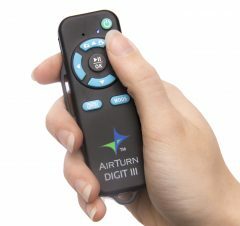 For handheld control, the AirTurn DIGIT and AirTurn Digit III are small enough to fit in the palm of your hand. The Digit III can be clipped to your key chain, strapped to a mic stand or instrument, or attached to a lanyard. Both use silent button design ensures that no one hears any tell-tale "clicks" when you're ready to trigger the next track in your playlist.